I did a post called “Playing in the Dark” four years ago when a cranky old white guy was facing off against a slender young half-black guy in the race for the White House. I recycle the title now because it seems dispiritingly apt in the wake of this week’s Republican convention, which was, long before actor Clint Eastwood took the stage Thursday evening for his bizarre colloquy with a chair, given over to boxing with a phantom: the America-hating, welfare-loving, freedom-killing, Muslim socialist “Barack Obama” conjured by the fevered imaginations of white men terrified of losing their power and privilege. Eastwood’s crude, contemptuous rant might have been the most off the wall, but it was by no means off message. From the moment Obama took office, Republicans have sought to depict him not only as a failed president but somehow an illegitimate one. They’ve indulged the birthers in their midsts, bragged about their determination to deny him a second term, and framed his every move as an assault on liberty. 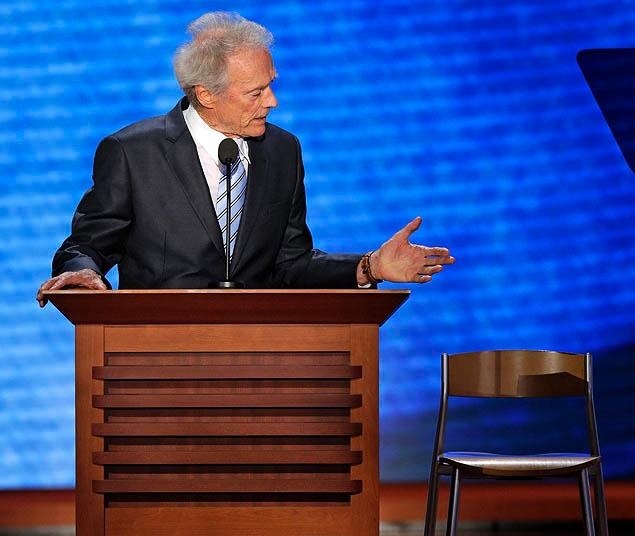 Eastwood’s suggestion to the Invisible Obama in the chair that he should “just step aside” so that “Mr. Romney can kind of take over” is perfectly consistent with this strategy. Republicans have been saying ever since they tried to remove a president from office over a sexual indiscretion that elections don’t matter. Voters don’t know what’s good for the country. We’re the ones who should be running things, as we always have. Step aside, boy, Eastwood might as well have said. The people had their tears of joy, their happy little moment of racial harmony. Step aside. WaPo‘s Dan Balz thinks the effects of Eastwood’s speech will be short-lived, that “the big debate will reengage. Attention will shift back to the issues that really count” — though he recognizes that the focus on substance will only last “until the next Eastwood-like moment distracts everyone again.” I may be wrong, but I think the effects of Eastwood’s speech may be longer lasting and more damaging to the Republican campaign than Balz supposes. Viewed on television, Eastwood’s 12 minutes of semi-coherent public disrespect for a sitting (get it? sitting?) president came across not as funny but as callous, arrogant, and creepily anti-democratic. Oh, and more than a little bit racist. The party faithful in and out of the hall might have been amused, but I have a hunch those 12 minutes will turn off independent voters and fire up a Democratic base that up to this point has seemed lacking in enthusiasm for this election. Here’s my prediction, which I will be bold enough to post before Nate Silver has a chance to gather and carefully analyze the post-convention polls: Romney’s post-convention bounce is going to be underwhelming and will quickly fade, even if Obama doesn’t get much of a bounce from a convention likely to be even less suspenseful than the GOP snooze-fest was. Romney will lose the election, by more than polls have been suggesting is likely. And when the history of the 2012 election is written, Clint Eastwood will be blamed for thwarting Romney’s momentum by crystalizing for voters the race and class resentments that are the heart and soul of today’s Republican party. If I’m right, I’m a genius. If I’m wrong, I’m just an English prof who ought to keep her day job. Still, kids, mark my words: You play in the dark, sometimes you’re going to get lost. And sometimes you’re going to bump smack into your own damn self. Remember where you heard it. I hope you are right! here’s with you! I hope you are spot on! An empty chair for an empty suit seems quite appropriate. Obama hasn’t lived up to his promises. “GAIL I was sorry the hurricane gave the Republicans an excuse to toss out Donald Trump, who’s become like Weird Uncle Ferd Who Lives in the Basement. If they’re using him to raise money and rally the birthers, they should be forced to display him on TV, right alongside every single person of color running on the Republican line for any office higher than Board of Zoning Appeals. “The stage show looked like America, but the convention hall did not. The crowd seemed like the sanctuary of a minority — economically wounded capitalists in shades from eggshell to ecru, cheering the man from Bain and trying to fathom why they’re not running the country anymore. The speakers ranted about an America in decline, but the audience reflected a party in decline. . . .I ran into Christopher Shays, a delegate and former congressman. I asked the Connecticut moderate if he felt lonely at the conservative masquerade ball. I could go on, but really nearly every news agency you read notes that the Republican Convention had race resentment on full display–they’re bitter that “Americans relate less to the tall, handsome, rich prince of a famous political family than to a skinny black dude of mixed parentage who spent a lot of time in Indonesia” and bitter that when the “blindingly white older male delegates greet[ed] their young, blue-eyed future” Ryan with so much enthusiasm all of the reports were about the latter’s great affection and devotion to Big Lies. Consider this: the man is incapable of telling the truth about his performance in a marathon. He claimed to have run a marathon in less than three hours and then claimed that he just misremembered. He ran a marathon in 4 hours and 1 minute. “Misrembering” a marathon performance by an hour is downright laughable. Madwoman ran a marathon in 1999 in 4 hours and 14 minutes and she remembers the time to this day. That a candidate for the Vice Presidency would lie about such a thing tells us much, much more about his character than he apparently guesses. Why would one lie about something so easily checked? Oh, I forgot. He lied about almost everything else he mentioned in his speech, including that he, who would destroy Medicare, Medicaid, and otherwise shred our social safety nets cares about those among us who are poor and defenseless. A Liar like that once led Germany on a grand experiment known as the Third Reich. An unfathomable number of people died because of that Liar. You ran a 4h. marathon? We are not worthy! We are not worthy! I guess “misunderestimating” his marathon time is par for the course with Ayn Ryan. It’s why he can say things like “we will save Medicare” and “Obama cut the work requirement for welfare!” when of course the opposite is true. Do you know how you can tell Ayn Ryan is lying? His lips are moving. Yes, it’s true that, like Ayn Ryan, I have run in one marathon in my life, the Marine Corps Marathon of 1999. Also like Mr. Ryan, I finished the race in a little over four hours: 4:14, as the Woman Formerly Known as Goose precisely notes above. Unlike Mr. Ryan, who was 20 years old when he ran his race in 4:01, I was 40 years old when a strapping Marine hung a finisher’s medal around my neck and said, “Yes, ma’am, you did a great job.” So, this Young Gun who boasts about the P90X workouts he does every day (what the heck ARE those anyway?) beat a middle-aged broad by a whopping 13 minutes and has the balls to lie about it 20 years later. And the reason we know about it is because the last outpost of truth in American journalism, Runner’s World, did a little digging (I’m guessing it involved a Google search) and uncovered the race results. You’re right, Historiann: You can be sure Ryan is lying if you see his lips moving. And if you see his legs moving, well, they’re probably not moving that fast. And thank you, dear Geoffrey, for the obscure reference to my demand for carbo-loaded gels while running my race. Betcha anything Ryan bonked because he didn’t have enough Goo when he “ran” his marathon. Rugged individualist that he is, he probably didn’t have a well-equipped support team to make sure his legs got what they needed. Thank goodness I had a posse of pinko queers to keep me going. Also, Joan Walsh has a nice piece up on Salon about why this particular lie matters. It’s here. This is brilliant, Madwoman, and thanks for the links to the Daily Show. As soon as Eastwood (finally!) left the stage, I was wondering what Jon Stewart would do with it, and his take on Eastwood, Romney, and the whole convention was a virtuoso performance. Thanks, too, for calling your shot. I’m waiting to see which way the wind blows in my ancestral homeland along I-75 and the I-80/90 corridors. I’m just disappointed that Romney emerged with the nomination in a terribly weak field of R aspirants, and he is unable or unwilling to be a candidate that will push Obama on the things on which he truly needs pushing. Akin, Eastwood, and the other loons are doing all of Obama’s work for him, so he can sit back and collect pro-choice women’s votes and Latino votes without lifting a finger. Where are the true liberals on civil liberties and the environmentalists? Silent and compliant. Hey Historiann — Actually George Romney was eligible to be President. He was born in Mexico to American citizens and they chose American citizenship for him. So he fits a definition of “natural born.” But that fact still reveals the birther stuff about Obama to be the hateful lie that it is. What the Romney folks are not so open about is that when George Romney’s parents returned to the US, they subsisted on government funds for a time before being able to support themselves. Also, were they open about the fact that Mitt’s great-great grandfather, Parley P. Pratt, was one of the ORIGINAL Mormon apostles chosen by Joseph Smith–you know, they were the Quorum of the Twelve modeled on Jesus’s band of merry men. So both Ryan’s family (interstate building) and Romney’s family have depended heavily on government assistance. Mmm. . . .